Born in Philadelphia, Andy Warhol (1930-1987) began as a commercial artist in an advertising agency and was to become one of the leading exponents of Pop Art, which he himself defined as “the art of making the ordinary original”. In 1962, he put on a show of his famous silk-screen prints of Coca Cola bottles, followed by the Campbell’s Soup and Heinz Tomato Ketchup. He went on to apply the same treatment to the stars: Marilyn Monroe, Liz Taylor and Jackie Kennedy. This was Warhol’s way of satirising our consumer society, attacking it through its most universally respected myths: consumer products which on canvas were seen to be full of nothing, famous faces frozen in magazine-picture attitudes which transformed them too into more consumer products. The painter himself did not escape. His studio, which he ironically christened “The Factory”, became the conscious antithesis of everything American society stood for: haunted by louche admirers and hangers-on, Warhol himself, with his dyed hair and heavy make-up, became a work of art. 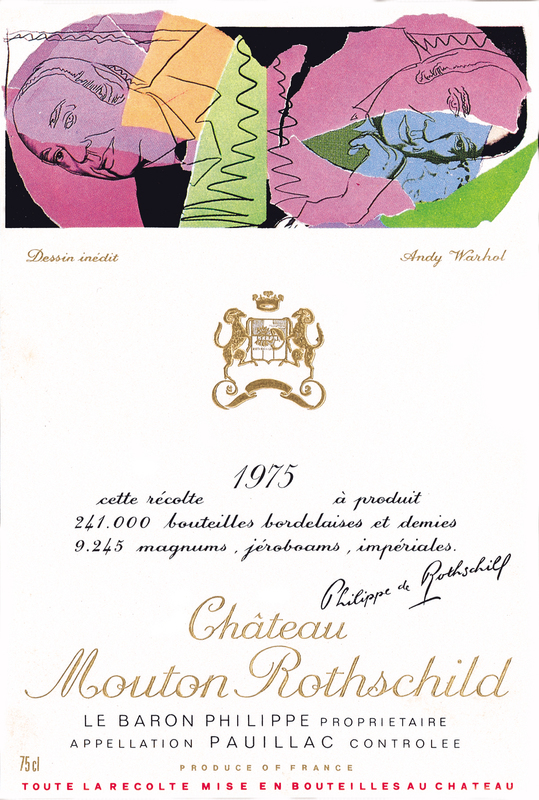 For the 1975 Mouton Rothschild label, Warhol, working as always from photographs, is in semi-serious mood, juxtaposing different studies of Baron Philippe.